Previously all users could access all Server tasks as well as files in the public folder. 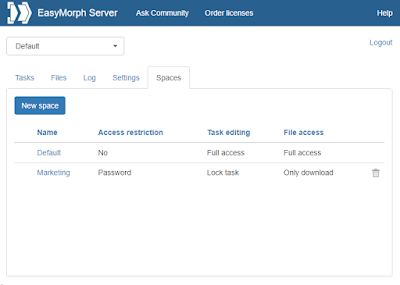 Starting from this release EasyMorph Server introduces spaces in order to offer more granularity and control in managing access to tasks and files. Spaces are managed in a new tab called “Spaces” visible only to the Server administrator. Lock project – a user can edit task schedule, task parameters, but not create tasks, or change the project in a task. Full access – no restrictions, the only mode where new tasks can be created. A space can be password-protected. In this case, a user should provide correct password in order to access tasks and/or files. Performing operations through the API with password-protected spaces also requires providing a password. 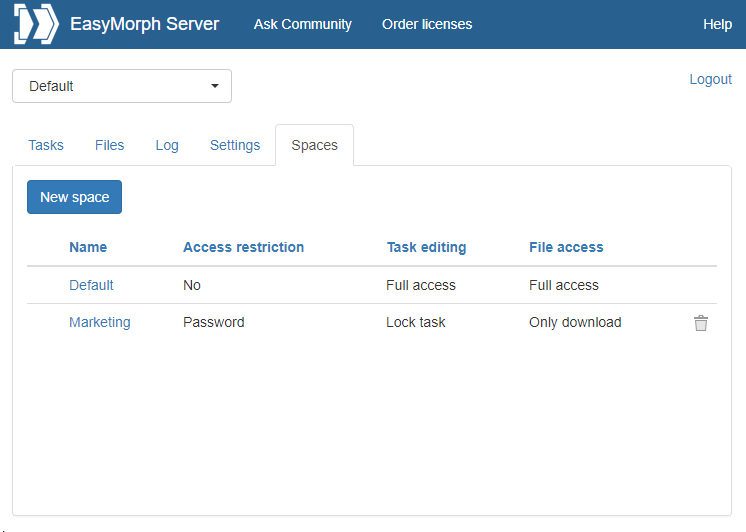 The command-line client and EasyMorph Server .NET SDK have been updated accordingly. By default, the Server settings and space configuration is only allowed from localhost. However, it is now possible to enable remote administration. In this case, it is possible to configure the Server from a remote computer, after providing a valid administrator password. It is now possible to execute a batch script when the Server service is starting or stopping. Modify onstart.bat or onstop.bat located in C:\Program Files\EasyMorph Server\systemscripts accordingly. This capability can be used, for instance, to map additional network drives on server start, or to send an email notification when the Server service is shutting down or rebooting.